TowBoatU.S. 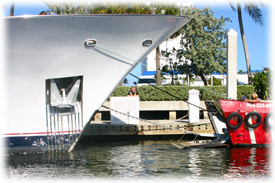 Ft. Lauderdale offers a vessel equipped with a knuckle boom crane with a lifting capacity up to 7.5 tons. 96' vessel, M/V Richard L. Becker equipped with a 7.5 ton crane boasting a 41' reach, suitable for large items that may be located on upper decks. "This service has become popular with Motor Yacht captains and engineers throughout South Florida" states Barney Hauf, Director of Sales. "Captains and Engineers have found that by using one of our vessels, they can quickly and safely accomplish the same job that would have previously required a land-based crane as well as relocation to a boatyard or a berth in the port." TowBoatU.S. 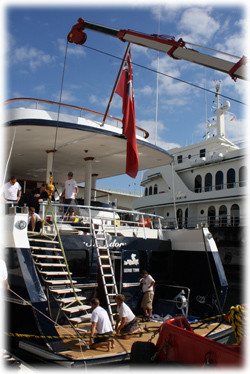 Ft. Lauderdale has assisted Motor Yachts with lifting operations involving refrigerators, generators, and life rafts just to name a few. In addition, there are several vessels in the fleet that can assist when the time comes to service or replace your anchors or anchor chain. The crew of TowBoatU.S. 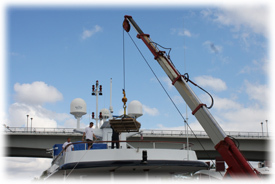 Ft. Lauderdale is skilled in crane operation as well as yacht towing, and we use great care to ensure that each one of these operations is safe, successful, and damage-free. Please contact us the next time you require this kind of service.